Watch Bone Thugs N Harmony live, catch a Spanish flick for free, join a Chinese painting workshop, and more! 1. WATCH BONE THUGS N HARMONY LIVE. 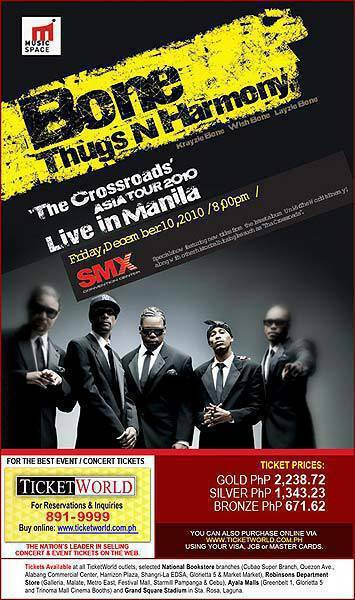 Catch Bone Thugs N Harmony Live in Manila for their The Crossroads Asia Tour 2010 on January 8, 8 p.m. at the SMX Convention Center, SM Mall of Asia Complex, Pasay City. Ticket prices are P2,238.72 for Gold, P1,343.23 for Silver, and P671.62 for Bronze. 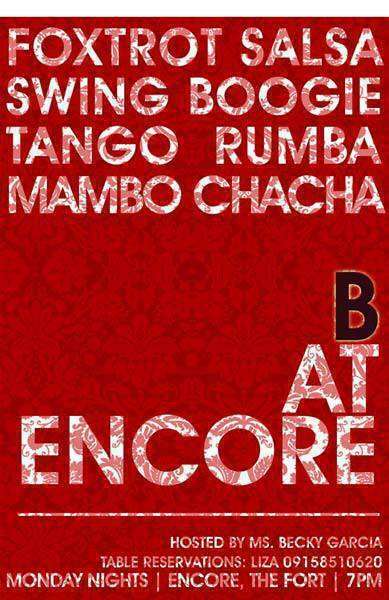 For tickets, call TicketWorld at 891-9999. 2. CELEBRATE MUSIC WITH TOPNOTCH CHOIRS. 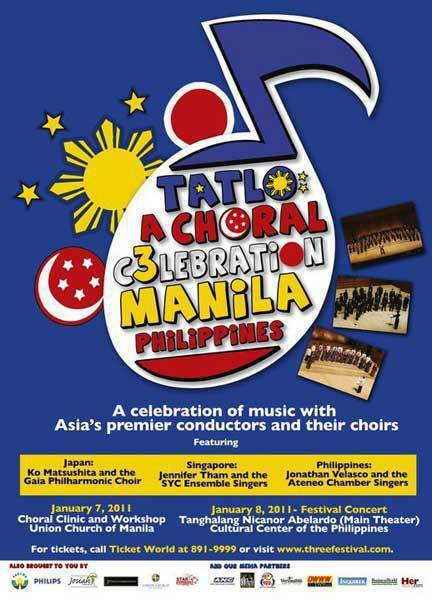 Watch TATLO: A Choral Celebration on January 8, 8 p.m. at the Tanghalang Nicanor Abelardo (Main Theater), Cultural Center of the Philippines, CCP Complex, Roxas Boulevard, Pasay City.The event will feature Ko Matsushita and the Gaia Philharmonic Choir from Japan, Jennifer Tham and the SYC Ensemble Singers from Singapore, and Jonathan Velasco and the Ateneo Chamber Singers from the Philippines. Ticket prices are P1,200 for Orchestra Center, P900 for Orchestra Side, P750 for Balcony 1 Center, P500 for Balcony 1 Side, and P300 for Balcony 2 Center/Side. For more details, contact TicketWorld at 891-9999 or visit www.threefestival.com. 3. WATCH A SPANISH FILM...FOR FREE! 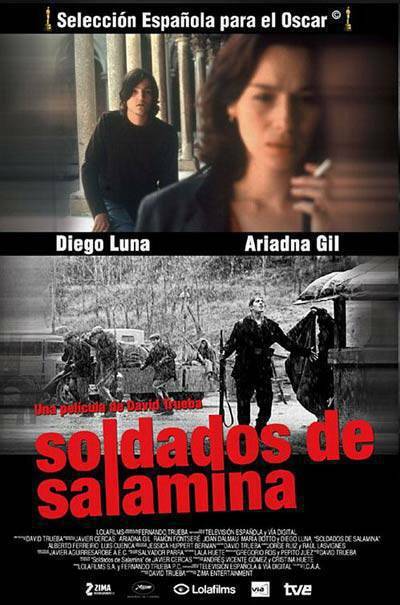 Watch Soldiers of Salamina on January 8, 6 p.m. at Instituto Cervantes de Manille, 855 T.M. Kalaw St., Ermita, Manila. The film tells the story of a novelist who starts researching on an event that occured during the last period of the Spanish Civil War with the hope that he’ll find the resolution to his personal conflict. Admission is free on a first-come, first-served basis. For inquiries, call 526-1482 to 85. 4. SHOP YOUR WAY TO A HAPPY NEW YOU. It’s time to get a new look for the new year. Don’t miss the Una Rosa All-P500 Sale, which runs until January 15 at all Una Rosa outlets. 5. BUST THE MYTHS OF THE HUMAN BODY. 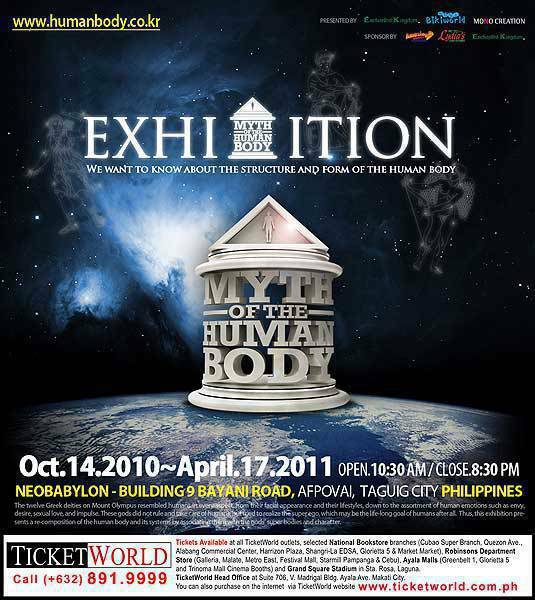 View the Myth of the Human Body exhibit, which runs until April 17, 10:30 a.m. to 8:30 p.m. at the Neobabylon Building, 9 Bayani Road, AFPOVAI, Taguig City. See real preserved human bodies, through the process called plastination, from this successful travelling exhibition. Ticket price is P360.50. Three-year-old kids and below will get free entrance. 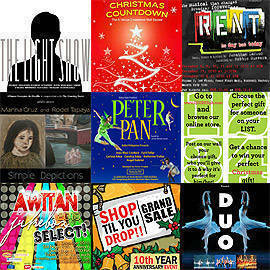 For more details, contact TicketWorld at 891-9999. 6. RUN FOR LOVE AND LIFE. Join Run for Love. 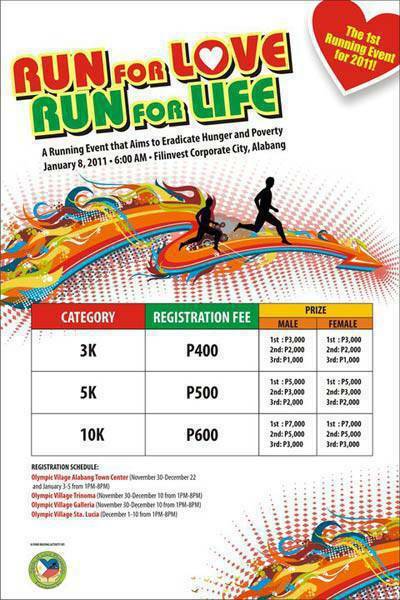 Run for Life., a running event which aims to eradicate hunger and poverty, on January 8, 6 a.m. at Filinvest Corporate City, Alabang. Registration fees are P600 for the 10K event, P500 for the 5K event, and P400 for the 3K event. For details about registration, click here. 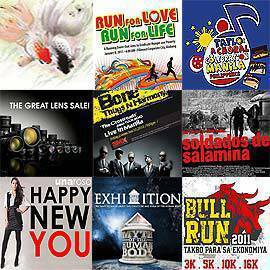 For more updates, contact jifh.holphi@gmail.com or visit www.runforloverunforlife.blogspot.com. 7. LEARN HOW TO PAINT, ORIENTAL-STYLE. 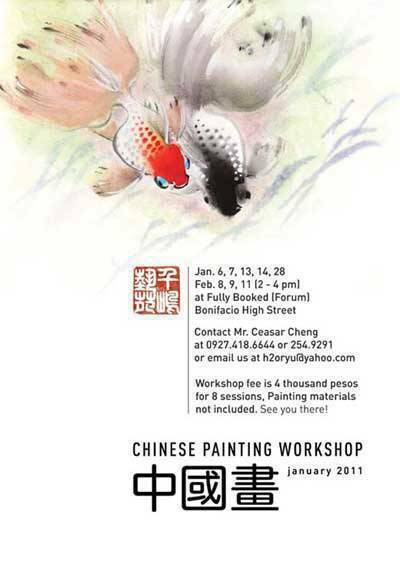 Learn the art of Chinese painting at the Chinese Painting Workshop at The Forum, 4/F Fully Booked, Bonifacio High Street, Taguig City on January 6, 7, 13, 14, and 28, and February 8, 9, and 11, from 2 to 4 p.m. Workshop fee is P4,000 for eight sessions. Painting materials not included. Interested participants may contact Mr. Ceasar Cheng at (0927) 418-6644 or 254-9291 or email h2oryu@yahoo.com. Calling all photography buffs! 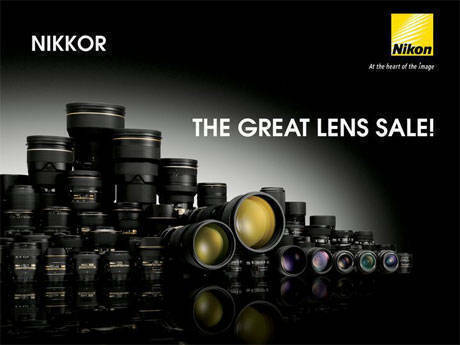 Don’t miss The Great Lens Sale by Nikon until January 15. Participating resellers include Columbia Head Office, Digital Walker, and Camerahaus. Click here to see the participating branches. 9. POWER THROUGH A BULL RUN. 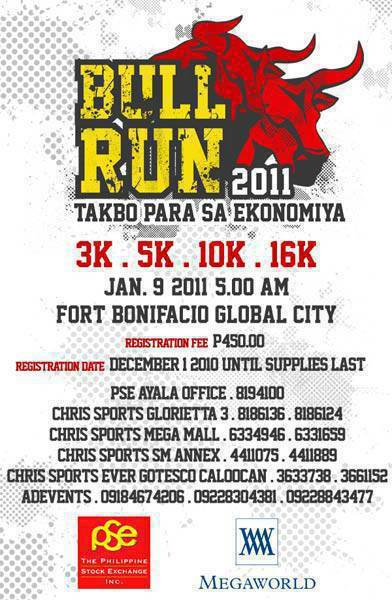 Join the Philippine Stock Exchange (PSE) Bull Run 2011: Takbo Para Sa Ekonomiya on January 9, 5 a.m. at Fort Bonifacio, Global City, Taguig. Registration fee is P450 for all running events--3K, 5K, 10K, and 16K. Registration is ongoing until supplies last. For inquiries, contact (0918) 467-4206, (0922) 830-4381, and (0922) 884-3477. For more information, visit their website at www.psebullrun.com. 10. GET YOUR ART ON. View Another Country, a collaborative project by Brisbane-based artists Alfredo Juan and Maria Isabel Aquilizan; Matt Dabrowski and the Many Hands of Glamour, which runs until January 9, 11 a.m. to 8 p.m. at the mo_space Gallery, 3/F Mos Design Building, B2 Bonifacio High Street, Bonifacio Global City, The Fort, Taguig City. The exhibit shows the concept of contemporary art production and the diverse forms used today like installation, soundscape, new media, photography, and found objects. For more details, contact 856-2748 extension 2 or (0917) 668-3951. 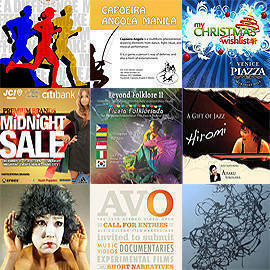 You could also email exhibitions@mo-space.net or visit www.mo-space.net. 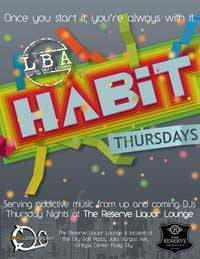 19 East - Mocha Girls, 9 p.m.
B-Side - B-Side Experiment featuring Don P, Mulan, Red-I, Soulflower, Timmy C (New Zealand), and other special guests, 10 p.m.
Handlebar Bar and Grill - RazorBack, 9 p.m.
M Cafe - Got Soul Fridays at M Cafe featuring DJs Ms Badkiss and Kristian Hernandez, 10 p.m.
Penguin Gallery - Spy and Alak Pa, 8 p.m.
Route 196 - AMP at Route 196: 2142, Dressed Up Days, Leonecast, Athome, Nanay Mo, Verbacoma , Blast Ople, 8 p.m.
Saguijo - Zero Productions, 6 p.m.
19 East - Ecoustic Soul, 9 p.m.
Penguin Gallery - Juan Pablo and Maria Cafra, 5 p.m.
Route 196 - AudioHeavy Productions at Route 196: Nyctinasty, Even, Gaijin, Moonstar88, IndayBote, Memory Kill, and Farcaster, 8 p.m.
Saguijo - Badburn, Doki, Kalayo, Severo, and more to be announced, 6 p.m.
19 East - Moymoy Palaboy, 9 p.m.
Izakaya - Moshi Moshi Mondays at Izakaya featuring Top 40 music by Aimee Macoy, Marie Garcia, and surprise guests, 5 p.m.
Route 196 - Jumpstart! The Route 196 Auditions: lineup to be announced (free entrance), 8 p.m.
Izakaya - Izakaya Unplugged featuring music by Norby of Overtone and Junji of Velcro, 5 p.m.
Route 196 - Live at Route 196: Jack vs. The Crab, plus other bands to be announced, 8 p.m.
Saguijo - Play4Serve x Revolver with General Luna, Imago, Sandwich, Tanya Markova, and more to be announced, 6 p.m.
Route 196 - Helm Of The Realm at Route 196: lineup to be announced, 8 p.m.
Saguijo - Saguijo Presents Hip-Hop Night with Ill-J and Iconic, Miscellaneous, The Out of Body Special (OBS), Protege, Skarm, and more to be announced, 6 p.m.
B-Side - Tubby Trousers at B-Side featuring Bagetsafonik, Gaijin, Helen, Valetparking, and Identikit, 9 p.m.
Penguin Gallery - Don’t Panic it’s Acoustic, 8 p.m.
Route 196 - Live at Route 196: Dong Abay, 8 p.m.
Saguijo - Kind Assault with Sighborg [Korea/US], Turbo Goth, Wilderness, and more to be announced, 6 p.m.
Eivissa - Twisted Fridays featuring DJ Marvin, DJ Jet, and DJ Markie Madness, 10 p.m.
Encore - B at Encore hosted by Becky Garcia, 7 p.m.
LAX - Dollar Wednesdays, 10 p.m.